Next Level Chiropractic is a bright, organized office with a professional, friendly team ready to assist you. You’ll find that we offer you a pleasant place to be with background music playing gently. Our patients love to talk to one another and often recognize each other since our practice is primarily based on referrals. We look forward to meeting you! We’ll have gotten your insurance information over the phone, if applicable, and will have it verified before you arrive if possible. You can find the necessary paperwork on our website and bring it in with you completed to save time. 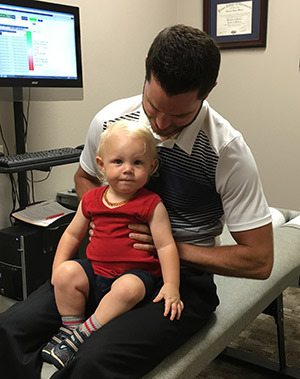 Once you’re here, you’ll meet our front desk chiropractic assistants. One will take you back to the examination room. Then, you’ll meet your Doctor. They’ll do a consultation with you to understand your history and what’s brought you in today. Then we will take some digital X-rays according to the nature of your problem. You’ll receive a relief adjustment, if warranted, to help relieve any discomfort you’re experiencing. You can then schedule a return visit, usually the next day, to determine what plan of care is appropriate for you. After you check in at the front desk, we’ll get you started on any therapy that is a part of your treatment plan. Then, you’ll meet your Doctor who will go more deeply into the details of your X-rays. A game plan is put together to get you feeling better and make a strong impact on your health. You’ll receive an adjustment and any home instructions necessary. This visit typically takes 15 – 30 minutes from door to door. On your routine visits, you’ll check in, have any therapy as appropriate, receive an adjustment and schedule your next appointment on your way out the door. You may have heard that once you start chiropractic, you have to continue going forever. There is no requirement that you maintain care. Like brushing your teeth to prevent cavities, chiropractic care can help you maintain your health. You can be proactive in addressing your well-being, rather than waiting for a crisis to occur. Schedule your time for a same-day appointment! We even offer free consultations and have digital X-ray facilities located conveniently on-site. Contact us today!